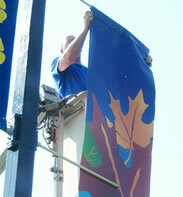 For years customers have taken advantage of Thomas Brady & Associated Artists’ decorations and banner installation, takedown and storage services. Our bucket truck crews currently serve our commercial decor customers throughout the Mid Atlantic, New England and Midwest regions. Imagine having one of the big tasks necessary for the holidays completed without having to worry about hiring your own expensive installation crew, storing expensive decor having to put them away again. 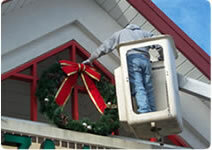 Let our professional Christmas decoration installers take care of that for you. 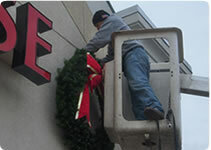 It costs less than you think to make the installation, takedown and storage of your banners and Holiday decorations hassle free. Contact us for a price quotation.